PEKA President, Puan Sri Shariffa Sabrina Syed Akil said the 15km race will start and end at the Pelangi Hill Resort Camp. There will be several ‘check points’ throughout the race to challenge the participants and promote awareness on the importance of rainforests. The race trail will include scenic routes along the Kerling Hot Springs in Hulu Selangor. Similar to previous years, SORR 2018 aims to educate participants on the conservation and preservation of forests. 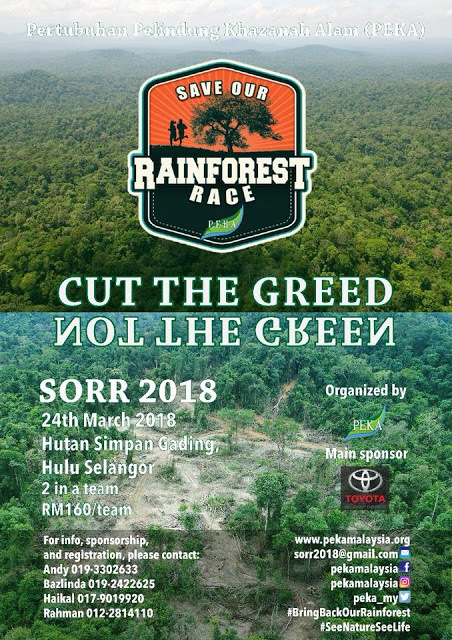 Puan Sri Shariffa Sabrina hoped the race will be a platform for the public especially the young to appreciate and better understand the importance of preserving rainforests. She said PEKA Malaysia is concerned about indiscriminate logging nationwide which has affected water catchment areas and the loss of wildlife habitats. Given the present state of affairs, she added PEKA Malaysia will continue to champion issues concerning the destruction of our national treasures and advocate for reforestation activities. Puan Sri Shariffa Sabrina stressed the importance of forest conservation efforts to protect the eco-system, reduce effects of climate change and preserve water catchment areas for the benefit of Malaysians and Malaysia. Representatives from companies sponsoring SORR 2018 were also present at the event. They include main sponsor UMW Toyota, Concorde Hotel Shah Alam, Tanah Aina Sdn Bhd, Women’s Sports and Fitness Foundation Malaysia, Pembinaan CW Yap Sdn Bhd and several other supporting sponsors. Others present include representatives from the Jabatan Perhutanan Semenanjung Malaysia (JPSM), Jabatan Perhutanan Negeri Selangor and founder and mentor of Cempaka School, Dato’ Freida Mohd Pilus. The registration fee is RM160 per team and each team must comprise two individuals. To register, kindly visit PEKA Malaysia’s website or contact Haikal at 017-9019920, Andy (017-3302633), Bazlinda (019-2422625) or Rahman (017-9019920).